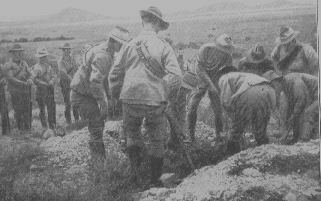 The Boer War was a watershed event for the British Army, the Boers employed hit-and-run tactics that not only caused losses the British could not afford, they did not conform to the usual "gentlemanly" rules of war. 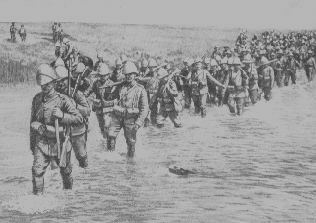 The British Army started off with 12,546 men in South Africa when the war began, but the number of officers and men actually employed from first to last, during the war, was officially given as 448,435. It became clear to the British that they had to adopt new tactics to defeat the Boers. They needed to fight a series of battles over a long period of time covering wide areas of ground, this involved marching in long columns for days at a time across the vast plains or "veldt", often without proper uniforms or rations. The weather caused problems, with freezing temperatures and storms in the winter and very hot summers. 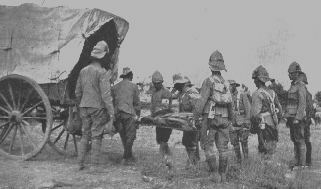 The Boer War, according to Rudyard Kipling, taught the British "no end of a lesson".. over 20,000 British Troops were laid to rest in the heat and dust of the South African veldt, with another 22,829 being wounded. There are discrepancies in the Casualty figures between the Official History and those recorded in 'The Times' Vol VII, whose figures are shown in brackets. 7,582 including 712 officers (7,894; 706 officers). 13,139 including 406 officers (13,250; 339 officers). Total Deaths 20,721 (21,942, includes accidental deaths). Please pay by PAYPAL or send a cheque, made payable to D J BARNES, along with your Stamped, Self Addressed Envelope.